Pic 'n' Mixx is a London indiepop night taking place sporadically at the Buffalo Bar, with live bands, dancing and a mix CD swap available for everyone who brings one with them - it's a bundle of fun. The night has previously garnered CDs made by the likes of Amelia Fletcher, Elefant Records, Internet Forever and Everett True. Those who don't bring one with are issued with a sad-face stamp on the door, to mark out their laziness and leave them regretting their decision the whole night long! Everyone who brings a CD receives a happy face stamp and gets to take home someone else's compilation. 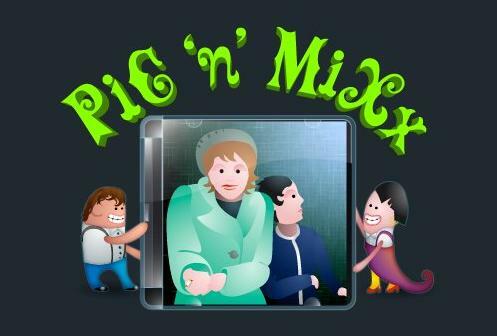 The Pic 'n' Mixx box is travelling to the Indietracks for festival-goers to drop off their mix CDs and collect one made by someone else before the weekend's out - a pathway to musical discovery! I'd love it as many of the bands playing could contribute one, and add a whole new level of excitement to the box. If you'd like to contribute a CD for the weekend in advance, you can send it by post to Natalie Shaw, 4 Stainsbury St., Bethnal Green, London E2 0NF, or by email to nat.musos@gmail.com. Artwork is welcome too, and you can send any questions to that email address. What happened to the happy face stamps :-( I dropped 4 CDs in the box, with no proof of the fact, and was told to come back later in the weekend to pick up Mix CD replacements. I just hope I look trustworthy enough that I don't get turned away! New headliners and day line-ups announced! DJ line-up for this year's Indietracks! Last chance to buy early bird tickets! Indietracks gets hip to The Beat!